My Love Affair with the Brain is a soon-to-be-on PBS documentary about the brain, the passion of scientific discovery, the creation of modern neuroscience, Albert Einstein, women in science, and love – all via the life and research of beloved professor and YouTube celebrity, Dr. Marian Diamond. Marian Diamond’s research demonstrated the impact of enrichment – a powerful new understanding of the brain that has literally changed the world, from how we think about ourselves to how we raise our children. Dr. Diamond demonstrated anatomically, for the first time, what we now call plasticity and in so doing, shattered the old paradigm of understanding the brain as static and unchangeable. 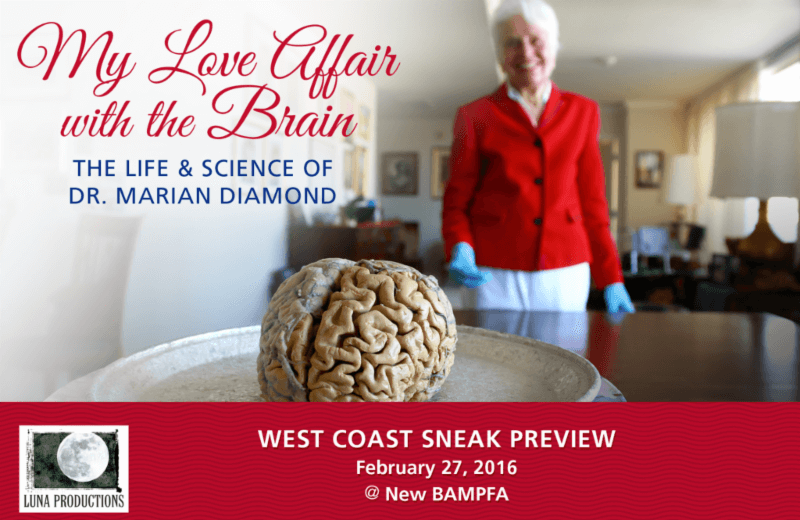 Join us for a special pre-release screening and program in celebration of Dr. Diamond and her pioneering contributions to modern neuroscience at the new BAMPFA! Seating is limited. Please arrive early to guarantee seating. Presented by BAMPFA, the Helen Wills Neuroscience Institute, Lawrence Hall of Science, Department of Psychology, Division of Biological Sciences, Integrative Biology, Molecular and Cell Biology, Center for Research and Education on Aging, Cal Alum and Luna Productions. Directed and Produced by Catherine Ryan and Gary Weimberg of Luna Productions.